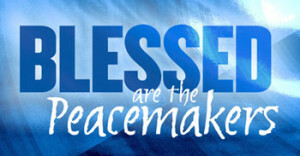 Jesus said, “Blessed are the peacemakers, for they will be called children of God.” (Matthew 5:9). What did he mean? I want to give a simple, personal reading of the teaching of Jesus the Christ and his Apostles on the Christian jihad and peacemaking. The most important point I will be making is that peacemaking is not primarily something we do, but rather something we are becoming. I have five headings. 1. The Nature of Christian Jihad. The extent of the Christian Jihad is global but, it is not territorial. Whenever Christians have tried to impose a particular political agenda, or create a so called “Christian” nation or empire, the consequences have invariably been destructive. In all four Gospels, and the Acts of the Apostles, Jesus commands his followers to take the good news of his kingdom, to the whole world. The expansion of the early Church from Jerusalem to Rome, at the time, the centre of the Roman Empire, is recorded in the Acts of the Apostles. Churches were planted in Judea, then Samaria, then Asia and then Europe, as people voluntarily choose to follow the teachings of Jesus the Christ, as the gospel was demonstrated through acts of compassion and mercy as well as by proclamation. Surprisingly the gospel spread most rapidly where the church was persecuted most severely. The Acts of the Apostles records repeated waves of opposition and persecution which led to martyrdoms. All of Christ’s apostles, for example, died as martyrs apart from John who died in exile on Patmos. Persecution served to grow the Church as they were scattered but was unable to destroy it. Acts 8 records one such instance. In what is known as the Sermon on the Mount, Jesus elaborates on what this means. Jesus called his followers to be peacemakers. Jesus insisted that we treat our so called ‘enemies’ in the same way God treats us. To fulfil their responsibility, Christ followers are designated as his ‘Ambassadors’ and are appointed primarily to fulfil the work of reconciliation. First and foremost we are to call upon people to be reconciled to God. The outworking of this transforms our human relationships, turning enemies into brothers and sisters. Ambassadors of Jesus are mandated to invite people to become citizens of his kingdom, and to do so respectfully and with gentleness. This is the radical, transforming strategy of Christian jihad. The language of the New Testament jihad is not about conquest or conflict, but about compassion, mercy, diplomacy, mediation and peacemaking. So far we have looked at the nature, the extent and the strategy of Christian jihad. The contrast between Christians and those who opposed them is most clearly seen in the weapons deployed in the Christian peacemaking. Jesus explicitly prohibited his followers from seeking to extend his kingdom by coercion or conquest. Jesus said to him, “for all who draw the sword will die by the sword.” (Matthew 26:52) The apostle Paul explains why. The battleground in Christian jihad is the heart, the soul and the mind. It is not territorial but intellectual. It is not imperial but of the will. In Paul’s letter to the Ephesians he uses the metaphor of the soldier to describe how to achieve ‘victory’. Notice that the Christian’s armour is entirely defensive, entirely defensive except for one item or armour. One weapon is allowed. The sword of the Spirit, that is the Scriptures. As the Scriptures are read, spoken, memorised, proclaimed, applied, taught or preached, something supernatural happens. The Scriptures are the only ‘weapon’ of Christian Jihad. We have looked at the nature, the extent, the strategy and weapon of Christian jihad. But the purpose of Christian Jihad is submission to the will of God. It is to become like Jesus – holy as God is holy – leading others into submission to his perfect will also, to know him, love him, obey him and so become like him. The glorious picture of the future revealed in Scripture is of the day when Jesus will return from heaven and ever knee shall bow. One day the whole world shall be brought into submission to God’s perfect will. Inshallah. For now, we have the opportunity to do so willingly and voluntarily. This is the heart of the Christian jihad and our calling to be peacemakers. Jesus said, “Now that you know these things, you will be blessed if you do them.” (John 13:17). This entry was posted in Bible, Evangelism, Human Rights, Peacemaker, Sermons, Theology and tagged peacemaker, Peacemaker Trust, peacemakers, peacemaking on January 28, 2016 by Stephen Sizer.